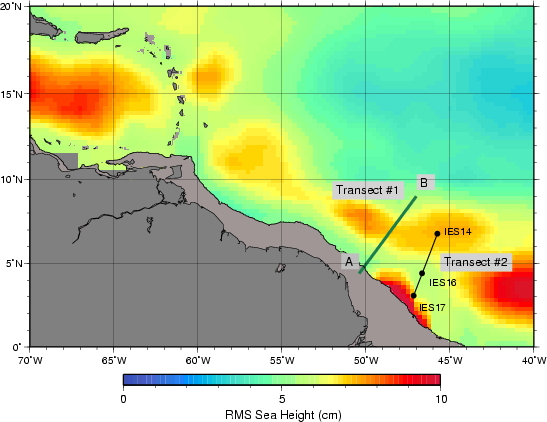 The root-mean-square (rms) of sea height (SH) over the NBC retroflection region between November 1992 and December 2004. The 1000m and 2000m bathymetry contours are superimposed. The rms of SH values for depths shallower than 200m are masked. The time series of geostrophic transport of the NBC and its retroflected flow are estimated across transect #1. The geostrophic transport of the NBC retroflected flow (only) is also estimated across transect #2 to compare with the results of the NBC Ring Experiment.